These superior grade Stack Tarpaulins from McVeigh Parker are designed to ensure that bales can be safely stored outdoors without loss of quality, and if well looked after will give many years use. The ’Performer’ range of bale tarpaulins are available in widths from 4.2m (14ft) up to 22.5m (74ft) and can cover stacks up to 17m (56ft) wide. 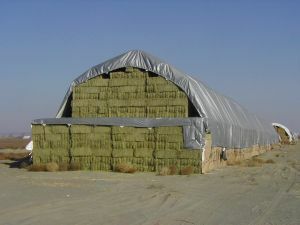 Sheets are available in lengths of 14.3m (47ft) up to 18m (59ft). The tarpaulin itself is manufactured from high strength, UV treated polyweave fabric with 7-8 years UV protection. Each sheet comes as standard with ’hook-in’ adjustable securing straps, that use a unique ’Super Cinch’, which enables the sheet to be quickly and tightly secured using tie-down dropper ropes, the ’Super Cinch’ and ’J’ hooks. In addition, incorporated into the hem of each tarpaulin are plastic pipe inserts, designed to keep the sheet rigid, and for the ties to pull evenly across the full width of the sheet, but still allow it to be quickly folded back in 1.2m (4ft) sections on itself and then re-tighted using the ’Super Cinch’. The hem also includes a rain flap that deflects water away from the sides of the stack. The new ’Bull Flex’ range is designed to be a cost-effective alternative to the Performer range. It is easy to use, has a far longer life than many ’off the shelf’ tarpaulins and will last on average over three years if well looked after. Instead of easily torn-out grommets used on cheaper tarpaulins, the ’Bull Flex’ is fitted with high strength triangular tabs and 5cm wide webbing tie-down loops. As an option, the ’Bull Flex’ tarpaulin can also be specified with the ’Super Cinch’ tie-down system used on the ’Performer’ range. For extremely exposed sites or where maximum tie-down strength is required, along each side the hem is sown to create a pocket into which plastic water pipe can be inserted to provide increased rigidity. A webbing draw-string is also built into each end, which once tightened will help avoid wind getting under the tarpaulin. This is a brand new product from McVeigh Parker for more details including prices contact our Kent depot on Tel: 01622 891095 or look at www. mcveighparker.co.uk Delivery available throughout the UK.